Suffering from shoulder impingement? Shoulders are fairly healthy and you want to keep them injury free? Want to drive up the poundage of your bench press? This week’s exercise, the dumbbell external rotation, can help with all those problems. Most training programs have a ton of internal rotation work (bench presses, pull-ups, pulldowns) and very little external rotation work. The pecs and lats, which work as internal rotators, tend to dominate the small external rotators of your shoulders. And what happens when programs are not some what balanced? Injury occurs or performance suffers. So if you’re not already including some external rotation work in your program, do it now. 1)Take a seat on the end of a bench, with your foot up on the bench so that the knee is bent. 2)Press the elbow of working arm directly into the knee that is up. This is your fulcrum. 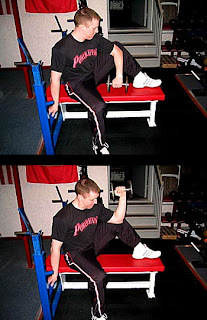 3)Rotate forearm down towards the bench. A couple of key points. One, try to keep the knee fixed the entire time by pressing the elbow and knee right into one another. Two, keep your chest up as much as possible. Three, try to keep your wrist straight so that tension is kept on the external rotators.